2016 was the year I took the whole summer off. What an amazing summer it was. Lots of nature. Lots of recovery time. Lots of fun and relaxing. It isn’t often you get a summer off, and it made me feel like a kid with the summer off. I can hardly believe that this was the 3rd annual Tailgating Snacks Month. This year I had some great blogger friends join in the fun! Some of my favorite tailgating recipes this year are the Those amazing Pizza Bombs, Dan’s Slow Cooker Carne Asada, that divine Pesto Avocado Grilled Cheese, and the Chipotle and Garlic cheesy Baked Dip. I always have so much fun with the tailgating snacks recipes! Next year I’ll be asking my friends to join in again, and maybe we can get even more awesome recipes for you! The year was truly a blur with how fast it went by. In the new year to come I wish you happiness and health. Please make sure that you hug your family members, as they are the ones who will be with you always, and the ones who will love you and mean the most in your life. 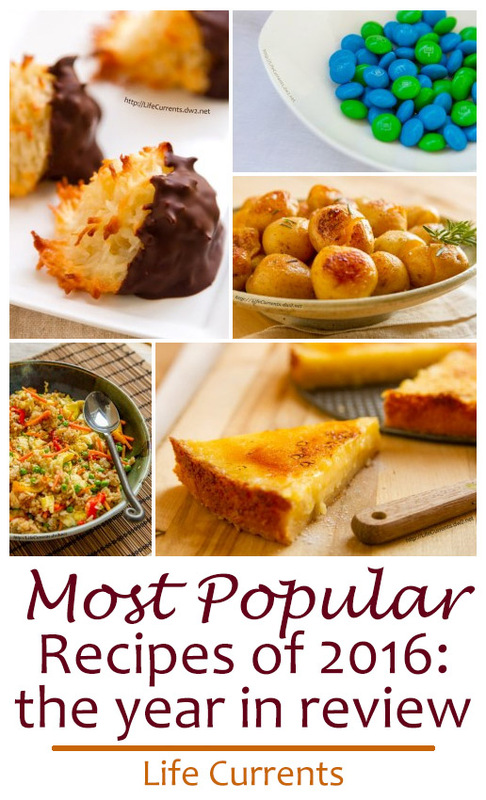 Here are my 9 most popular recipes & posts from 2016, as determined by page views. Vegetable Fried Rice has long been a favorite in our house. I love that it has lots of good-for-you veggies in it. And, most of the time, Dan makes the veggie fried rice around here. He’s just better at it than I am. Look at all those pretty colors and textures. I like that it can be made with leftover veggies, whatever’s in the fridge as well as frozen veggies that keep for a long time. I did a whole week dedicated to broccoli. It’s one of my favorite veggies. And, the fact that this is one of my most popular recipes shows me that you agree that this veggie rocks! Caramelized Broccoli is easy to make and super delicious! It gets all browned and nutty tasting! Yum, just yum! And this side dish will be great at any family dinner, holiday gathering, or weeknight dinner. I’ve made this Cream of Mushroom Casserole many times, and it’s always a winner. Comforting, cheesy, yummy. It’s the kind of dinner that your whole family will love, and you can feel good serving it. Even my husband, who doesn’t like mushrooms, loves this dish, and has asked for it many times. The trick is to chop the mushrooms up really fine so they don’t know they’re in there. A great appetizer for any party – football party, New Year’s Eve party, family gathering, anything. Really easy to make, and delicious! It’s all creamy and good too because it has healthy avocado inside! Tangy lemon mingles with creamy ice cream to make an addictive dessert treat. This is one of my favorite ice creams, and I know you’ll love it too! My Meyer Lemon Brulee Tart came form a challenge to come up with a lemon recipe. And, man is this one a winner! Easy to make and super impressive looking. It’s delicious! I’ve made it for Mother’s Day, Christmas dessert, and just a fun dessert to have any day of the week. This is the best Macaroon that I’ve ever made. One of my favorite cookies, I’ve been making this recipe for years. If you’re a coconut fan, you want to make this one! A delicious side dish that everyone loves. They get these crispy browned sides, and a creamy herby inside. Oh, these classic French potatoes are delicious. They’d be great on a holiday table (I’ve made them for Easter dinner several times), and I love to make them with a simple fish filet for a special weeknight dinner. These Pie Crust Cookies are so easy to make. Then pair them with an amazingly easy dessert spread including M&M’S®, and you have lots of fun entertainment for your guests during football parties, or anytime! Ooo, all of these recipes look too good!! I will have to try the coconut macaroons soon. Great recipes. I so need to make that caramelized broccoli right now. I’m drooling. Everything looks so delicious. I’ll have to make some of these. Looks like you had a great year, I’m jealous you took the whole summer off! That sounds fabulous! That veggie fried rice and lemon ice cream are seriously calling my name right now. YUM! Gosh, everything looks so yummy & it’s almost time for dinner. Caramelized brocolli caught my interest so just maybe … we’ll be trying that soon. I have made the pizza bombs before and they are..the bomb! But the pesto grilled cheese I must try! Sounds sooo good! I thought we are already done with this mouth watering holiday dishes? Chocolate dipped coconut macaroons caught my attention too. Thanks for sharing these recipes. I am getting married soon and i love to cook. This will going to be very helpful to me. Thanks for sharing. CHOCOLATE DIPPED COCONUT MACAROONS LOOKS VERY INTERESTING! IM SURE KIDS WILL LOVE IT! I BOOKMARK THE PAGE AND I WILL TRY TO DO IT THIS WEEK! Everything looks amazing! There’s no wonder these are the popular recipes for the past year. I’m looking forward to plenty more for this year!